You know we have a thing for castles, and while we love fairies and princesses, we have a much darker side. Join us as we explore five of the scariest haunted castles in Europe. You may want to keep a light on. Muwahahahahaha!!! Since we couldn’t decide which of these haunted castles is the scariest, we are leaving it to you. 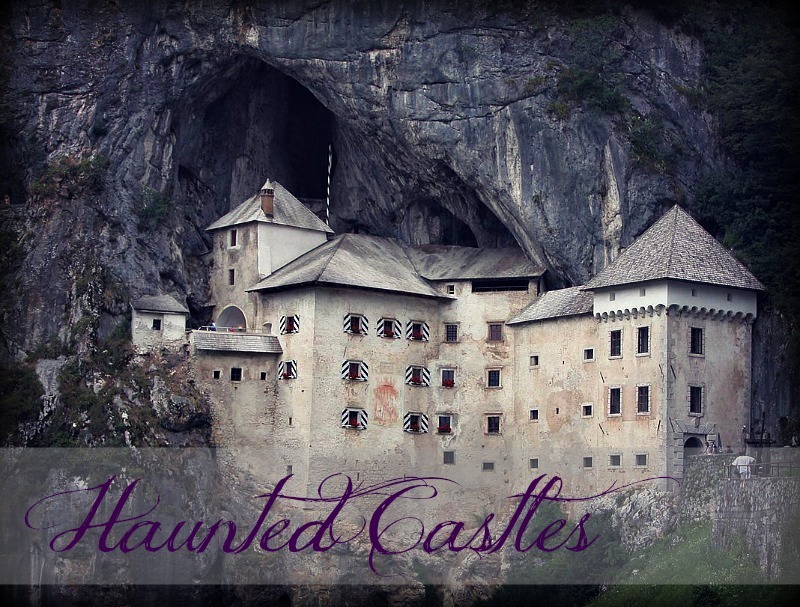 After reading this, please leave us a comment and share with us which of these haunted castles you think is most frightening. Would you spend a night in one of these haunted castles? We dare you! Built in the 13th century, this castle is also known as Witches Castle. Moosham Castle, was the location of the bloodiest, most gruesome witch trials in all of Europe. In the 17th Century, the archbishop of Unternberg, tried, tortured, and executed 1000’s of women for being witches. The women accused of being witches, were beaten, tortured, hanged, and some even torn in half; ripped apart between 2 horses. Many of these tortured women still roam the halls of the castle today, waiting to get justice. Today the castle is a haunted museum; many of the rooms are in their original state. Anton, the resident caretaker, during the witch trials is still seen wandering in the castle halls today. Often women and children can see him sitting in the castle, watching over the prisoners. Inside the castle many people feel a presence, being watched, touched, doors opening and closing on their own, and multiple apparitions appear and disappear right in front of your eyes. Often in the morning when the staff comes in to open up the museum; all the guns hanging in the hunting room will be hanging upside down on the wall rack. The staff swears the castle is locked up overnight, and have no idea how this continues to happen. Ghost Hunters International has even caught an apparition of a ghost on film, a man sitting in the dining room, they believe this is the caretaker Anton. If you are in Unternberg Austria and want to be scared stop by this haunted castle, and say hello to Anton. The name Frankenstein, even today, conjures up images of monsters and walking dead. The original Castle of Frankenstein is in Darmstadt Germany and sits high up on a hill overlooking the town. The castle dates back to 948 BC. In the 1600;s the last of original Frankenstein family died in a chariot accident, on his way to visit his true love, Anne Marie. He dies instantly, and was never to see his true love again. She waited, and waited for him to show, eventualy diying of a broken heart. Today she is still waiting in the castle for him to show up. Both the ghost of Knight Frankenstein and Anna Marie are still seen at the castle today, looking for each other in the darkness, and trying to reconnect. After the original Frankenstein Family died out a man name Konrad Dipple von Frankenstein took up residence in the castle. He was an alchemist, and grave robber. He was experimenting with dead body parts, and blood of virgins, and animal parts to make his potions, and resurrect the dead. His biggest creation was a monster made of dead body parts that he brought to life in his laboratory in the castle. The town’s people were afraid, and began to belive that he was the blood brother to the devil. The eventually stormed the castle, trying to kill Von Frankenstein. While barricaded in the castle, he drank his own potion, committing suicide, and died in his laboratory. However, the monster of Frankenstein escaped into the woods and many believe is still out there looking for playmates, and blood of virgins to keep him alive. Konrad Dipple is still practicing his alchemy, and grave robbing at the castle today, if you visit you just might catch a glimpse of him in the tower hunched over his lap equipment. The brothers Grimm actually told this story to the step mother of Mary Shelley, and in later years Mary Shelley visited the Frankenstein castle. She eventually used the story as the basis for her world-famous novel Frankenstein. Stop by and visit… if you dare. Many people have claimed to see the crazy alchemist hard at work in the dark of night, and the two lovers looking for each other near the chapel of the castle. The massive red brick structure looming over the town of Reszel has a haunting, and dark past. In 1806 the town was torched by arsonists, and all the wooden buildings of the town were burned to ground. In 1807 the police arrested a woman named Barbara Zdunk, for committing arson. However, she was not only accused of arson, but of setting the fire using witchcraft. Today, locals think that she was only persecuted because she caused a scandal, by having a very young boyfriend – she was 38 and her boyfriend was 19. She was sent to Reszel Castle dungeon to await her execution. During her 3+ year confinement in Reszel castle she was tortured, and repeatedly raped by her captures. She eventually gave birth to two children – but no one knows what happened to them. Eventually, she was publicly burned at the stake on the castle grounds. It is believed that she, and her unknown children still haunt the castle today. Often people report strange smells of perfume, things being moved, doors opening by themselves, and people getting touched. The worst are the blood-curdling screams coming from deep within the castle dungeon; where Barbara was once held. Stop by for a visit, you can even spend the night as today it also a hotel. This castle, was built into a cave jutting out from the side of a 123 meter high cliff. As many gothic castles it has a sordid and dark past. The castle was home to Erasmus the Knight who rebelled against the monarchy in the 15th Century. He had secret passage ways in and out of the castle through the caves and tunnels underneath. He was a Robber Barron, and all around nasty guy who tortured and killed his fair share of people in and around the castle. Predjama has tales of prisoners being bricked up behind stone walls, or thrown alive down a 63 meter deep cave under the castle. They lay crumpled at the bottom of the cave and left to die from injuries and the rats. Many were sent to the torture chamber where all things ghoulish happened. Erasmus eventually died in the castle, and is said to still rule the place when the sun goes down. People hear screams and cries of those who were tortured. Many have heard voices of those prisoners who are still behind the walls. All of the bodies still lie in the cave directly under the castle, so their souls roam the castle waiting for redemption. Visit if you dare to see the castle and hear some of the gruesome details of torture. This is my number one pick for the scariest, haunted castle in Europe. This castle is built in the middle of nowhere. There are no trade routes, no water, nor is it a strategic area. No one is sure why the castle was built. The entire castle seems to be built to try to keep someone or something from escaping the castle, instead of a trying to keep people out. The locals report that before the castle was built, there was a hole, so deep no one could see the bottom. That hole was called the Gate to Hell. Locals say out of the hole climbed half animal and half demon creatures along with black winged creatures that circled the area every night. These creatures are still reported today. Today over top of that hole stands a chapel, covered with paintings of angels and demons. The black magician Oronto of Sweden once made this castle his home and laboratory for his occult experiments. Later the Nazi’s used the castle to conduct dimensional portal experiments; genetic testing, and the torture of 100’s of human beings. Most people who visit here report feeling watched, and uneasy. The winged creatures are still spotted flying over the castle at night. Black figures, and apparitions are seen throughout the castle. Many paranormal groups have investigated this castle and all come to the conclusion that it is the gate to hell! The locals stay away from the place, they truly believe it has something evil behind the walls. Even dogs wont enter the castle, and normally start barking as theu approach the castle. For your scariest trip stop by and visit Haunted Houska Castle. I got chills just reading about it. I’d heard about the last Houska Castle before (I think there may have been a Ghost Hunters International about it, too). Creeeeeepy. Austria is somewhere I long to visit – blame many a watching of The Sound of Music. Will try to keep hold of my pants!